Governor Cuomo’s “SAFE Act”Anything But! That corruption led to the passage of the so-called SAFE Act (Secure Ammunition and Firearms Enforcement Act of 2013). Touted as a “gun control” law it goes far beyond the 2nd Amendment; it denies due process to any citizen targeted under the law. They did this by rewriting the state mental health law — can’t have crazies owning guns, right? Note that public discussion of the SAFE Act is centered around “gun control.” The denial of due process is never mentioned — purposeful ignorance. Better for anti-rights government officials of both parties to appear to focus on the 2nd Amendment rather than let people know they’re also going after the 4th, 5th, 6th and 14th Amendments. It was passed overnight with no hearings, and no public participation permitted; no input from law enforcement or medical experts. It does not comply with federal HIPAA law (the Health Insurance Portability and Accountability Act), according to the New York State Psychiatric Association. We should all feel nervous, even those of us who live in other states. States like New York, California, New Jersey, Connecticut, and Maryland are “beta” sites, incubators for more laws that restrict more rights. How could New York State, or any government, deny due process to an entire group of citizens? Rewrite the state Mental Health Law … to use a new definition of “mental health” that permits the state to easily allege a citizen is “mentally defective,” even based on false reports of INvoluntary commitment from hospitals. Provision 9.46 of the SAFE Act is now part of New York State’s amended Mental Health Law. Under the revised law, medical providers are still required to consider the “likelihood” that a patient is a danger to self or others . . . The “new” 9.46 Section deliberately omits “imminence.” In other words, medical providers are no longer required to consider whether the person is an “imminent danger” to self or others. We’re now seeing more examples of hospital staff deliberately or inadvertently falsely identifying a patient’s hospital admission as “INvoluntary.” This immediately triggers a report to ISARS – the Integrated SAFE Act Reporting System – followed by confiscation of a pistol permit and firearms. Citizens are entitled to the same due process enjoyed by political elites and convicted felons. No one is above the law, supposedly. But we see more examples of one law for government elites and a different law for We the People. To restore due process in New York State – repeal the SAFE Act. Spread the word: Please post and share the 4-minute video with as many friends, groups and websites as possible. of taking many more of our constitutional rights away. Are all citizens entitled to due process? How would Governor Cuomo answer that question? How would your state senators and assembly representatives answer that question? Ask them. The badly named SAFE Act is unSAFE when it comes to civil liberties. It denies due process. This is never mentioned by the governor or elected state officials — purposeful ignorance. Better to appear to just focus on the 2nd Amendment rather than let people know you’re also going after the 4th, 5th, 6th and 14th Amendments. The SAFE Act (Secure Ammunition and Firearms Enforcement Act of 2013) was passed overnight with the leadership of Governor Cuomo and most Republicans and Democrats. Touted as a “gun control” law, it denies due process to any citizen targeted under the SAFE Act. They did this by rewriting the state mental health law — can’t have crazies owning guns, right? 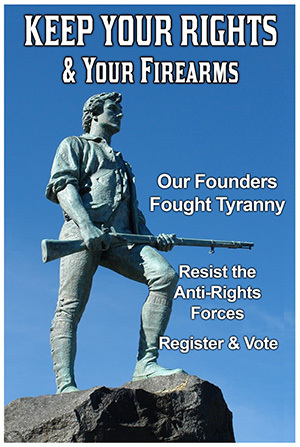 The right to own any firearm can then be denied and all firearms confiscated, with no notice, no hearing, no trial, and no evidence of mental disability. It is happening now even when a hospital sends a false report to the State Police that someone has been INvoluntarily committed.